The Eighties are often caricatured as the decade in which "we" all went a little bit silly, reacted against the austere disaffection of punk by wearing legwarmers, coloured rimmed glasses, highlights in our hair and swigging cocktails. (NB to makers of I Love The Eighties-style retro-docs and the inane pop commentariat in general: No "we" didn't. Only the twats). The Eighties were polarised but complex times. Punk, which determined even seemingly antithetical things like Depeche Mode and ABC, was itself a reaction against Old Labour rather than New Tory and was itself part of the same coin as Thatcherism, revolting against the same, dreary, dysfunctional 70s Britain. It's no surprise, therefore, that Paul Weller stated that The Jam would all be voting Conservative at the 1979 general election. Ian Curtis of Joy Division also voted Tory, even having the cheek to cadge a lift from the Liberal candidate to the polling booth. And yet, Weller would later be synonymous with the pro-Labour coalition Red Wedge, while Joy Division were for many the soundtrack to the anger and anxiety felt by many during the ravages of the early Thatcher/Reagan years. The rise of so-called New Pop, the likes of Spandau Ballet and Duran Duran and Wham! was viewed at the time and has been viewed retrospectively as the first flourishing of "Thatcherite pop". Michael Hann, writing in The Guardian has been able to denounce Spandau as such, citing singer Tony Hadley's commitment to the Conservative party. However, at the time, the real leader of the group, Gary Kemp, would have been more circumspect. The Spandau's were part of a painfully hyper-hip London club scene and to have pledged allegiance to Maggie would have represented at the time a far more grotesque gaffe than that later committed by Geri Halliwell when she associated Girl Power with an admiration for Mrs Thatcher. Sure, the narcissism and unabashed, mascara-thin superficiality of the New Romantic scene is arguably the supreme pop expression of Thatcherite "self-interest" - and yet, it was very popular in areas like Leeds and Wales, hit hardest by the recession, where dressing up rather than down was considered an act of young working class defiance in adverse circumstances. Wham! were all Tropicana and Go For It! But they also celebrated the potential freedoms afforded by the apparently perma-dole culture of Thatcherism. Conversely, the more dressed down white ska scene produced Madness, who always had problems shaking off their National Front following, while Oi, a purist mutation of early punk, was commemorated with an album entitled Strength Through Oi, a cringemaking reference to the Nazi slogan Strength Through Joy. Punk purists were wary of the incorporation of funk into post-punk, which they felt smacked of disco-ist hedonism. But punk-funk was always the most radical step, one first taken by ardent politico Bristolians The Pop Group with the likes of 'For How Long Must we Tolerate Mass Murder' and 'We Are All Prostitutes'. 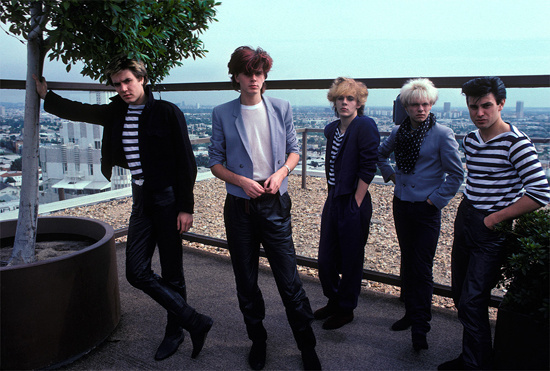 Thereafter, The Human League expressed subversion through synthpop, Shriekback, Scritti Politti and Gang Of Four adopted funk/disco mores to push through a subliminal, Marxist agenda, while Heaven 17 executed a sort of double-axle of irony with 'We Don't Need This Fascist Groove Thang' which was both sarky and sincere at the same time. Their 1981 debut album Penthouse And Pavement, moreover, looked like a visual precursor of the late 80s yuppy era with its ponytailed execs, etc. And, as they became more of a pop proposition, it became less clear whether they were brilliantly effective double agents, or mere purveyors of the sort of enervated, defeatist, bland neo-soul/pop which characterised the mid-80s and represented a sort of defeat to the new reality of right wing pragmatism. Anyway, such were the times, in which the battle lines, though complex and argued tortuously in the then-more powerful and radical inkies, were at least strongly drawn. Where are those lines now? This week's Spotify playlist features Heaven 17, The Human League, Gang Of Four, Shriekback, Scritti Politti, Cabaret Voltaire, The Slits, Wham!, Duran Duran, The Fall, Gary Numan, The Jam, Spandau Ballet, Depeche Mode, ABC, Joy Division, The Pop Group. Listen here.